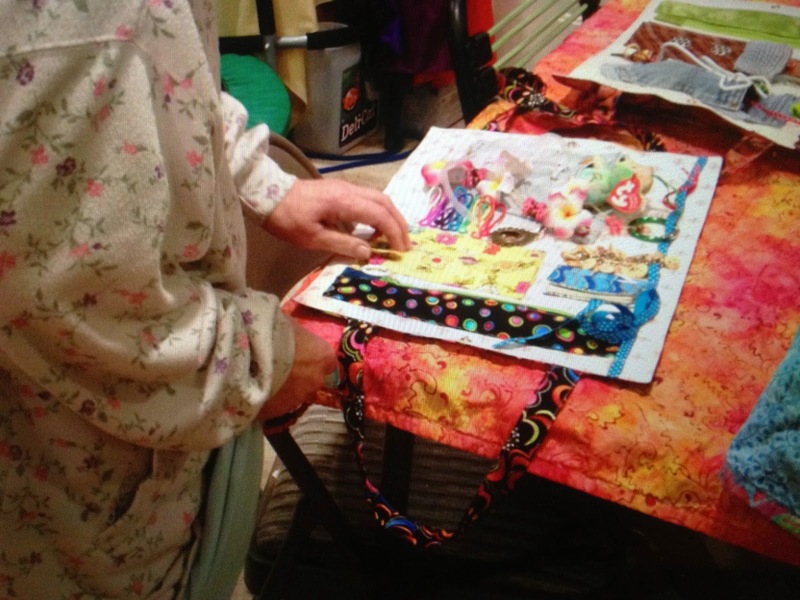 See instructions to make an Alzheimer's Activity Mat by Nancy Zieman. I used that web page to begin my project. I added handles so it can be toted around easily and all the goodies are kept inside. I call my version the Fidget Fun Mat. It was really fun watching the Fidget Fun mat in use!! Yay!! Closed it can be toted around like a purse. Open it and it's time to play. 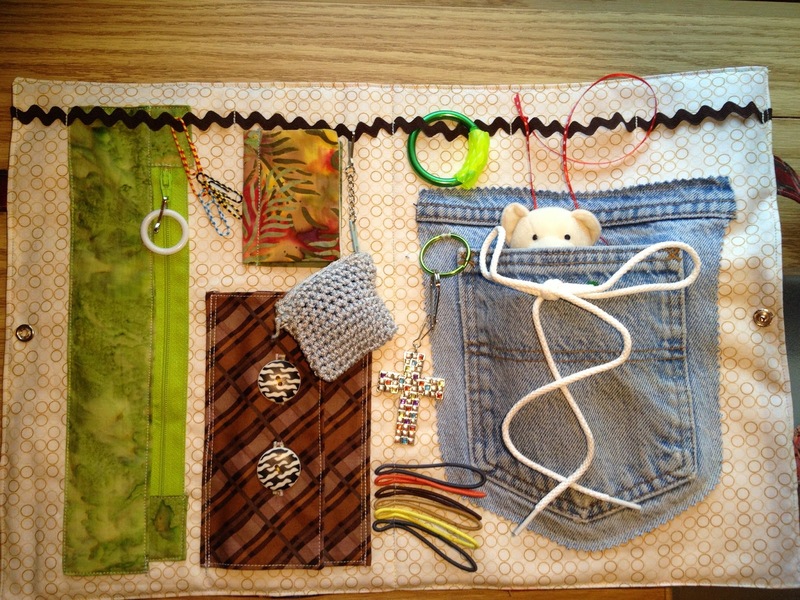 Start with 13x19 fabric for front and back. 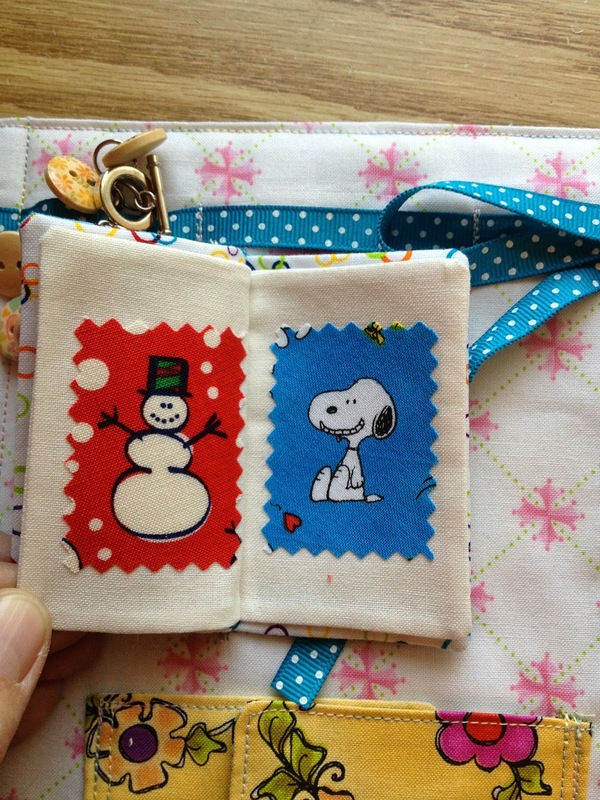 I used 12x17 fusible fleece centered on both pieces. Handles are cut 4" x 19" each, double fold to measure 1" x 19", topstitch along each edge. Mark center of each side and sew handles pointing in spaced 6" apart. The long zipper pocket can hold a tissue. 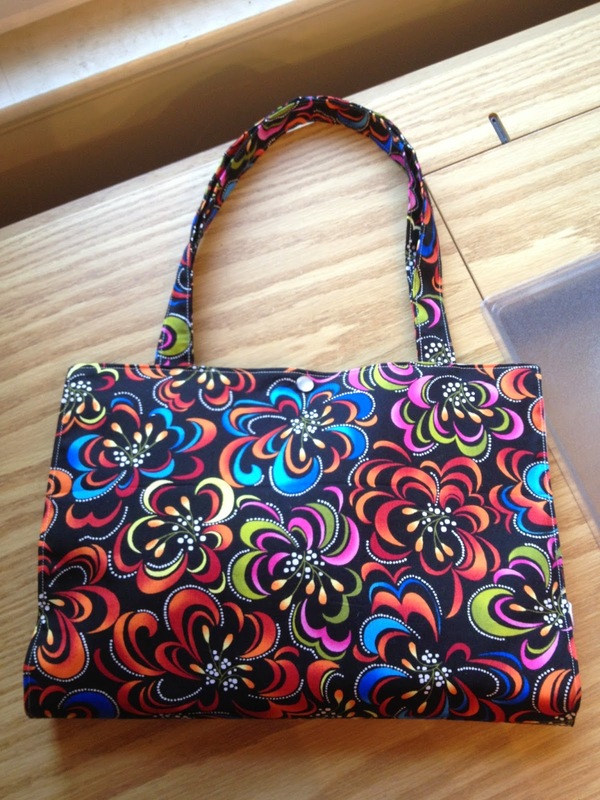 9" zipper with tabs attached and a pocket piece cut 4 1/2 x 11 1/4. Fold pocket piece RST, sew around edge leaving an opening to turn. Turn and topstitch to zipper. 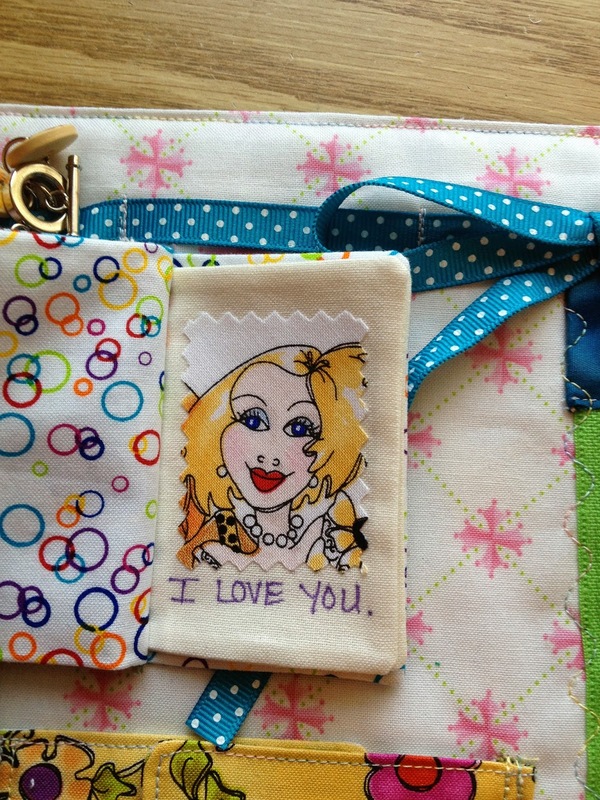 Sew to background by topstitching around perimeter. Button flaps hide a surprise. Cut 2: 7" squares, sew perimeter, cut in half, tuck raw edges in, topstitch perimeter of both pieces. Add buttonholes to one side and buttons to the other. 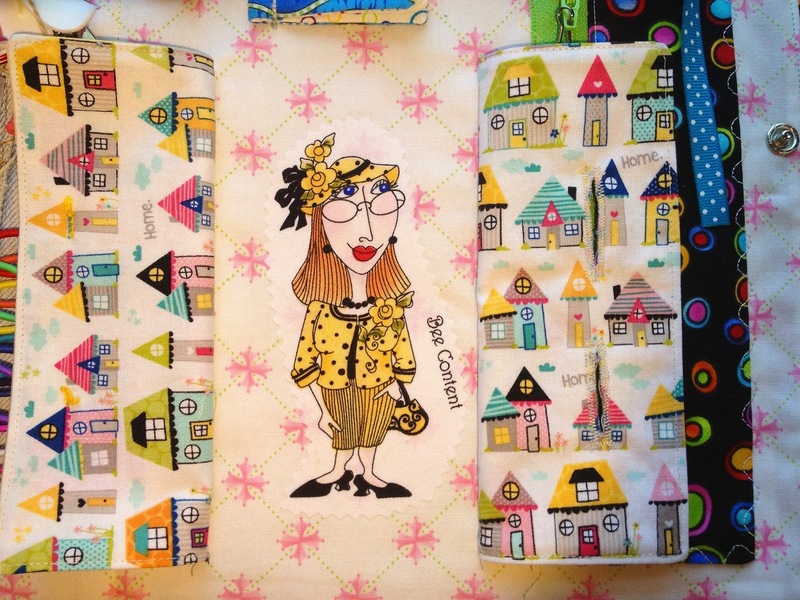 Secure to background by sewing one or two lines of stitching on left edge and one on right edge. This unit measures 4" x 6 1/2" when completed. Wonder Under fusible is the easy way to add a surprise inside the doors. 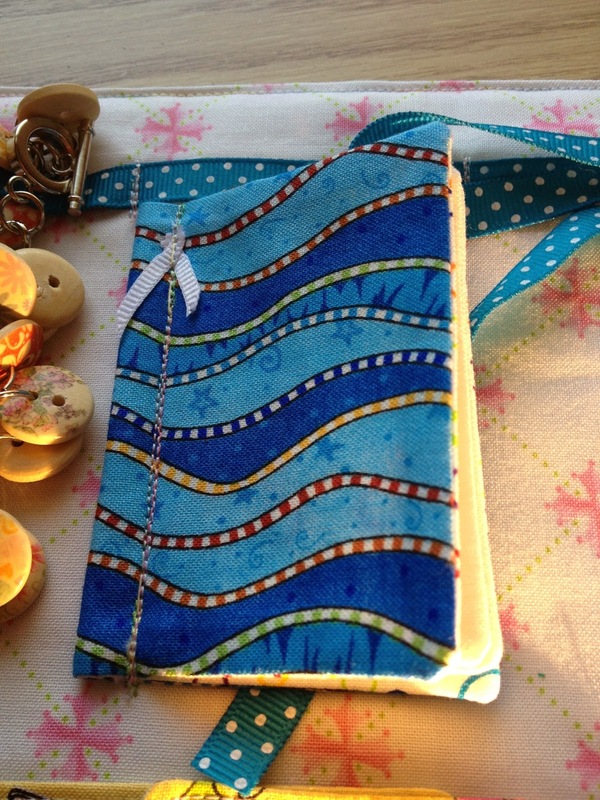 This is a little cloth book that has 2 pages inside. Again, use Wonder Under or Heat N Bond to add photos to the book. Snoopy is a familiar face to almost everyone. 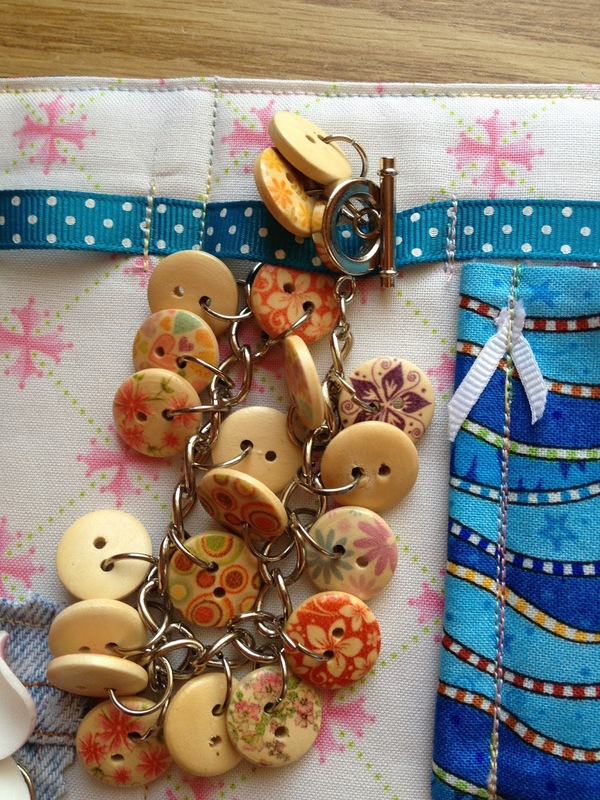 A button bracelet, easily made with a chain and small jewelry findings. I found these pretty buttons on ebay. 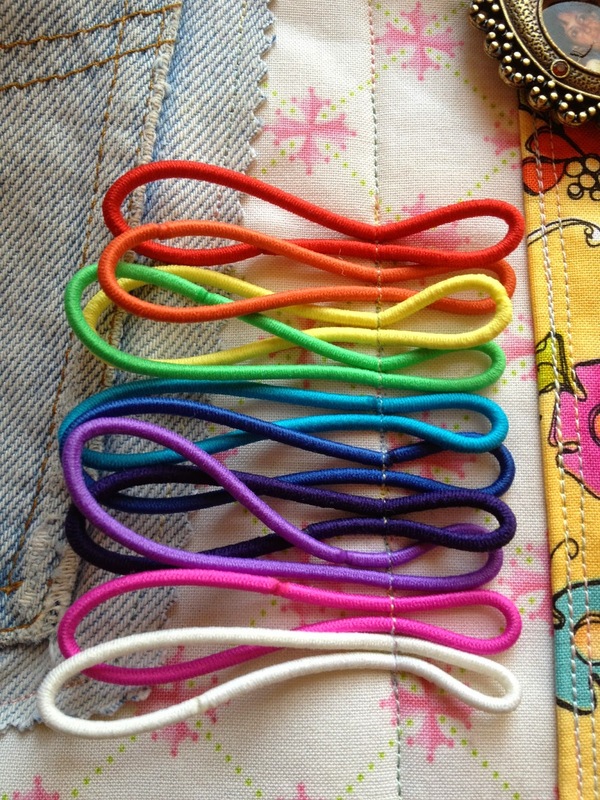 Elastic hair ties just for fun!! These are added at the end after the mat is turned right side out. 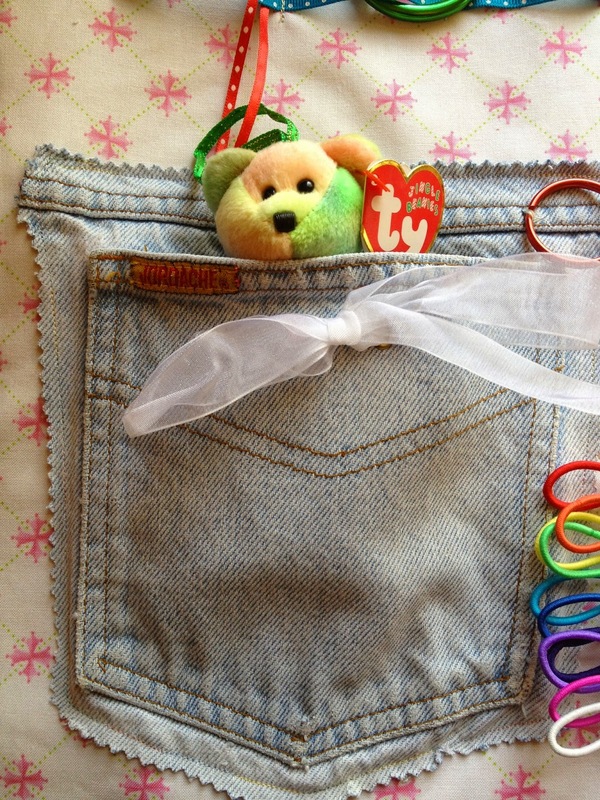 Recycled blue jeans pocket. Edges are trimmed with pinking shears and sewn down. These beautiful flowers are actually an air freshener that lost it's smell months ago. Too pretty to throw away. The petals are soft to touch. Add a ribbon (44" if it ties in a bow like the blue ribbon above OR 13" of rick rack like the brown below). 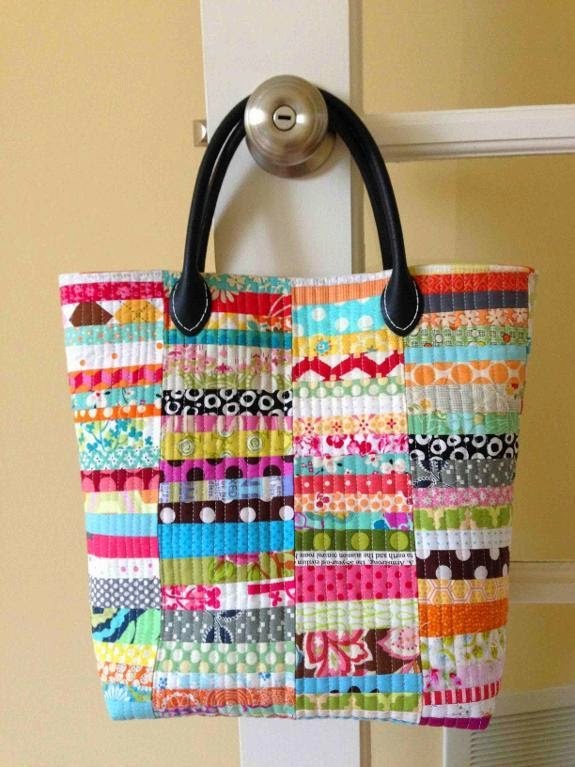 Sew it across the top by sewing it down every 2 or 3 inches. Use it to tie or clip things on. I didn't take a photo of it but after sewing all the pieces to the front background, lay it right sides together with the outer fabric. Make sure handles and other goodies are all tucked inside. 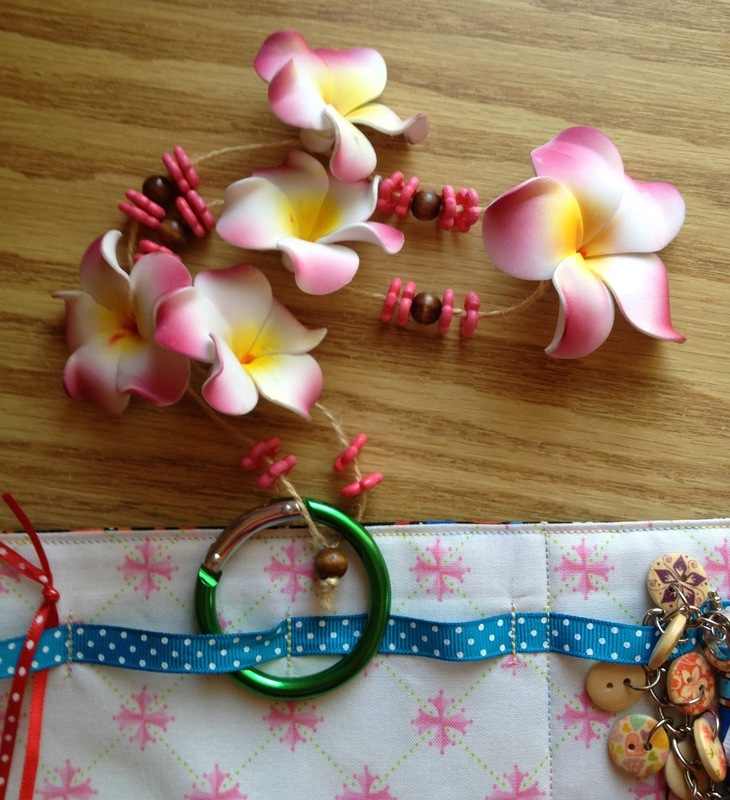 Pin around the edges and sew but leave a 6" opening at the bottom to turn right side out. Sew 1/4" seam then turn, press edges. tuck raw edge of opening in 1/4". Topstitch 1/8" around perimeter. I added a snap closure in the center of each side. Velcro would be good too but I didn't have any on hand. See other Finish It Friday Fun. how fun. This would be great for a quiet book for children for church, too. That's a lot of work. Did it take you long? It took me 2 days to make 2 of them but I was deciding what to do, how big to make things, etc. Now that I have the measurements listed it will be much quicker. And you can use whatever you have at hand. I used an old purple rabbits foot on the last Fidget Fun Mat I made. Look for interesting things to attach. All the little trinkets, the colours and surprises make this a real joy ! I have mad a couple with items on there that can be put in the washer and dryer. I love them. 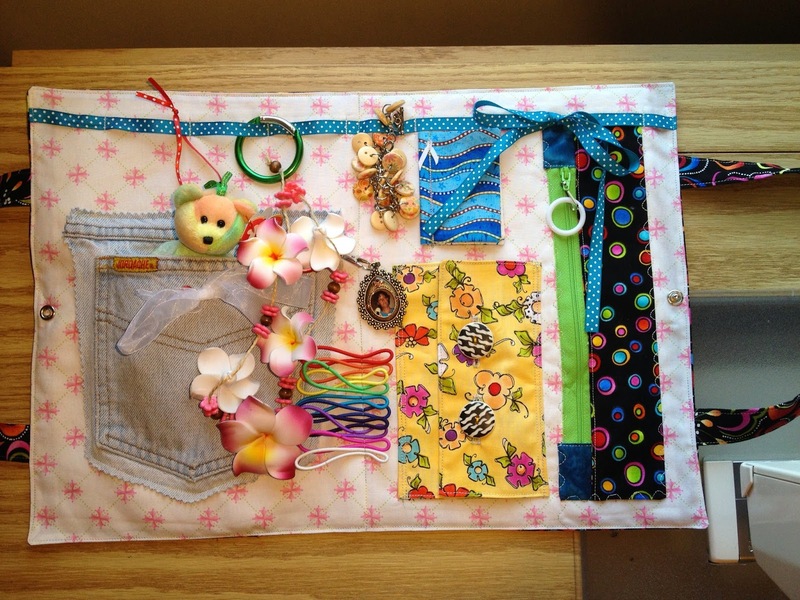 What a grand way to make a busy (fidget) mat! 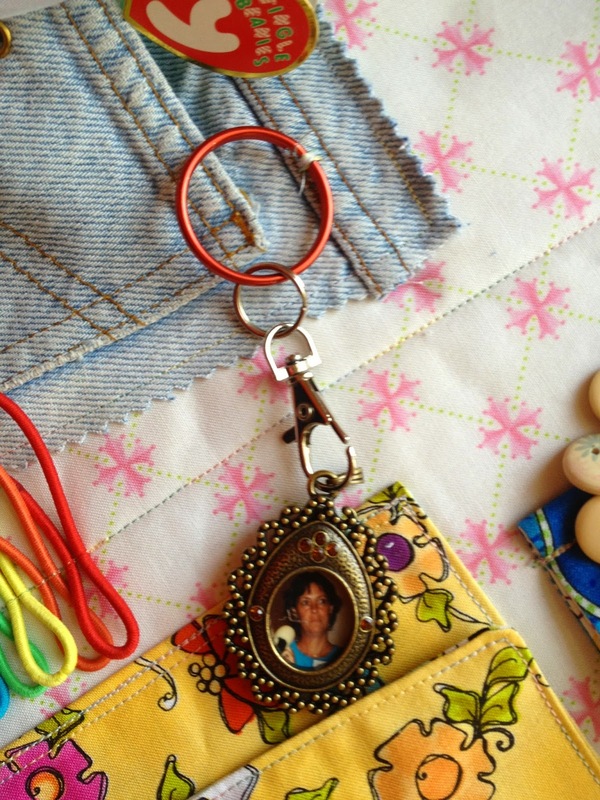 Pockets, flaps, trinkets and more; fun to make and a pleasure to give. Forgive me for commenting on an aging post but your work needs recognition. I want to buy one of these for my mother. She is still quite alert besides Alzheimer's and baby play mats etc are just not appropriate. Can somebody make her one ? 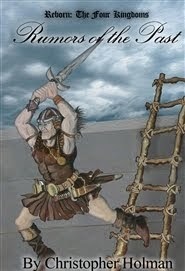 Contact me at johnnamae@gmail and let me know how you did with your Alzheimers book ! What does rst and wst mean? I believe it means right side together and wrong side together. Some people with dementia (my Mum) can destroy half the things on that. My Mum is a shredder who can rip apart and eat or flush the most amazing things so please take that into account with what you attach and how you attach it. Just saw your post. I really want to try this and you have taken a lot of guesswork out of the equation. Thank you so much for sharing your talent. Summer Dress--If you can't find one, make one! Grand Illusion finale--double sided quilt!